Anne Dudley Bradstreet arrived with her husband Simon in the Puritan colony in 1630. 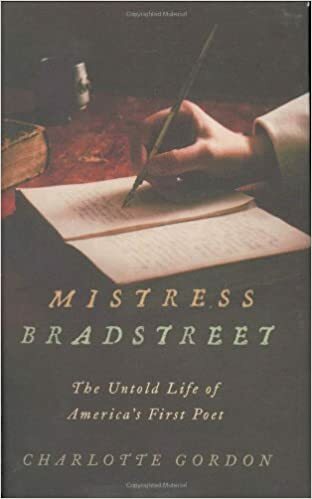 They sailed on the same ship with John Winthrop, the man intent on establishing a “city upon a hill.” Bradstreet was 18 at the time, and she hadn’t been happy about giving up her comfortable life in England for an uncertain one in North America. But she was a dutiful and loving wife and an observant Puritan. Her place was with her husband. Bradstreet gave birth to eight children, the first arriving about three years after the couple settled in Massachusetts. Life in the new colony required everyone to work. Bradstreet was always busy in her home, taking care of her growing family, coping with health issues. Several times, Simon moved the family, attempting to increase his income and his political standing. Though her domestic duties took up much of her time, Bradstreet was a passionate reader, and now, as she struggled to cope with her new circumstances, she scraped together some spare time to write poetry. This was not something a woman was expected to do. Bradstreet would have been sensitive to Puritan beliefs about gender roles. She was a contemporary of Anne Hutchinson, and Simon Bradstreet participated in Hutchinson’s interrogation. Still, Bradstreet kept writing poetry, most of which honored God and acknowledged the joys and pains of family life. Her poems circulated among family members, and Bradstreet’s brother-in-law arranged to have them published anonymously in London in 1650.